A fast acting cement, concrete and mortar cleaner with low environmental impact. Safer than traditional hydrochloric acid based stain removers. Cleans tools and cement mixers. 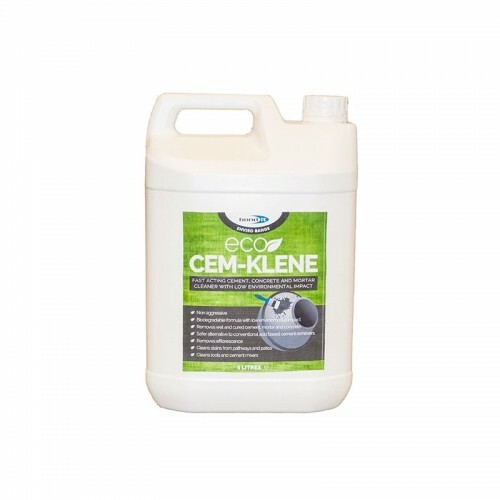 Safer than traditional hydrochloric acid based stain removers, Cem-Klene can be used neat or diluted to treat areas and clean tools. Suitable for cleaning tools, cement mixers and removing efflorescence and mortar stains from walls, patios and paths. Can be diluted and used as a general purpose cleaner for ingrained dirt, grease and stains on concrete.